Are you searching for “Home Security Doors Paradise Valley” while looking for security door installers in the Paradise Valley, Arizona area? JLC Enterprises Can Help! 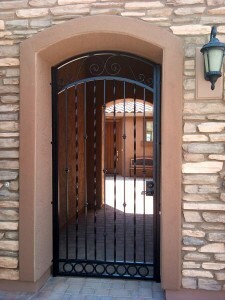 We are the best home security door contractor and installation contractor in Paradise Valley, AZ. When it comes to taking accurate measurements and talking about our products, our sales team is quite knowledgeable and will help you to complete your projects on time. The security of your home is very important. 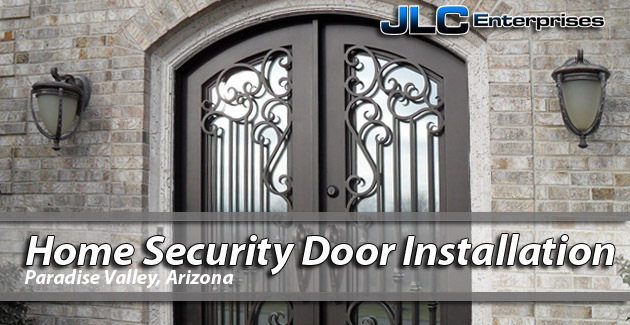 JLC Enterprises offers security door installation in Paradise Valley, Arizona. 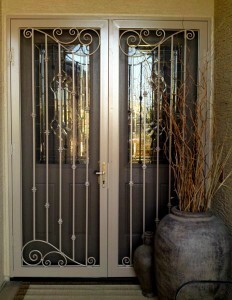 To get a free security door installation quote in Paradise Valley, give us a call today at 4809679183. Picking the right type of security door for your home can be hard, but it doesn’t have to be. With JLC Enterprises, we will be your first line of security. 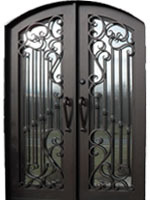 We are the premier custom manufacturer and derringer for Chandler’s security iron entry doors, steel home security doors, and steel security doors. There is a variety of security doors available. The American National Standards Institute established guidelines that most of the manufacturing companies follow, these standards are also recognized internationally. Besides the security doors that are made of steel, metal, and aluminum, mesh and heavy metal is also used for installing, which gives the ability for air to flow through while also protecting the home. Security doors are also designed to be sturdy, as they have recessed hinges that are specially made for them. Security doors are available to purchase at any home improvement store, however, it is of the utmost importance that these be installed by a professional. Professional installers of security doors in Paradise Valley will have all the necessary equipment for the job and the knowledge of properly installing them. Burglars and others who make a living at breaking into homes keep a look out for homes that are having new doors installed, and the first they take notice to is whether or not the installer is a professional, and if they are not they are thinking “well, this is going to be an easy job,” and that is because they figure right away it is not going to be securely installed. 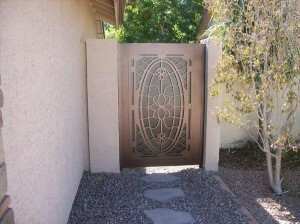 Besides the home security door installation in Paradise Valley, we also provide metal gate installation, sun screens, steel entry way enclosures, and window guards. Our skilled security door installers have been manufacturing and installing steel doors for over 30 years. 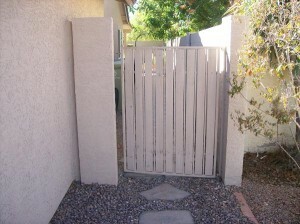 We offer various full custom to semi-custom metal gate and security door installation. We only provide the best selection of home security doors. We are able to customize the doors to suit your needs. Each door is measured then manufactured to fit the entry way of your home perfectly. They are fabricated with 16-gauge heavy steel, mounted within solid steel frames for a lifetime of protection. We do offer affordable priced security doors and this does include the oversized doors with no extra cost to you. We also have competitive pricing. If you have another contractor give you a quote, then we will either match or beat their price. We provide security screen door and security door services to Gilbert, Tempe, Mesa, Queen Creek, Paradise Valley, Ahwatukee, Fountain Hills, Sun Lakes, Phoenix, Chandler, and more. We offer competitive pricing and will either match or beat the competitions price. We have all the required licenses, insurances, as well as workman’s comp to keep you protected and safe. 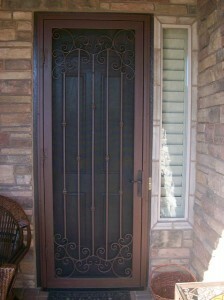 We are a one stop shop for all your security screen door and security door needs. 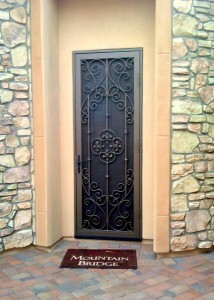 All of our security doors are manufactured and installed by JLC Enterprises. We will never use subcontractors for our work. A security door is one that has been specifically made to keep anyone from being able to pick the lock, for instance, no one would be able to use a card to open the lock nor would they be able to pick it with lock picking tools, and strong enough that it cannot be kick in or knocked down easily, keep in mind that nothing is capable of being 100% secure. However, a security door that has been specifically design for a home’s security will come pretty close to that 100% mark. What metal is best for a security door? The best metal is going to be metal alloy, steel or aluminum. Although, the toughest of doors will be made from genuine steel. Yes! Home security doors can keep out insects, scorpions, and other unwanted pests simply by adding a foam application under and around the door. Flush Mounting will be the best way to install your security doors as it creates the best seal due to there being no gaps around the doors opening. The locks that are used on a security door are manufactured by the guidelines of the American National Standards Institute. They make a variety of different types, for instance, the door bars, chains, and cylinder locks. Most businesses will also have the ‘door closers’ installed as well, when these are installed they are place directly on top of the door and are used to ensure the door closes each time it is opened, this, after someone enters or leaves the place of business. Ask about rekeying your security door to match your home entry doors keyhole. That way you will never need to use 2 keys again. Ask JLC to make it to where both of your keys will work for both keyholes. This makes it so your door won’t slam shut but causes it to close softly. A metered door corner is used to make the top and bottom of the door stronger. Other contractors will try to use a hollow corner, but this method can cause rust and water to penetrate the door. Rust is the fastest way to wear your door out. 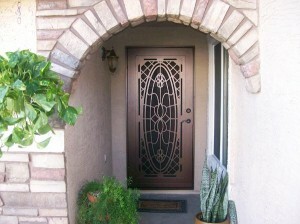 To get a free security door installation quote in Paradise Valley, give us a call today at 4809679183. Read our 5 star Google reviews in Paradise Valley. Are you searching for "Home Security Doors Paradise Valley" while looking for security door installers in the Paradise Valley, Arizona area? JLC Enterprises Can Help!